By combining Caravan's patented frame design with an anodized powder coated aluminum finish-you get top-notch high tech protection. 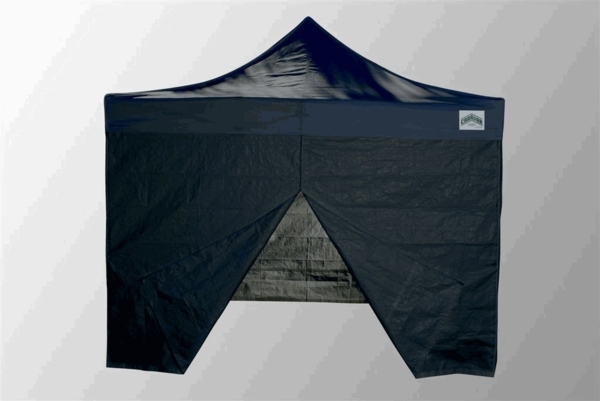 This Alumashade Black-Out Canopy is a package deal that includes a 10 ft. x 10 ft. lightweight aluminum frame, a 250 denier black polyester top, three 250 denier black polyester sidewalls that attach to the shelter using velcro loops, one 250 denier black polyester sidewall with middle zipper, stake kit with ropes, and a deluxe roller bag. Incredibly flexible and convenient, this portable canopy package can travel almost every where you need deep protection from the sun-including great outdoor photography and production sites. * Flame Certification: This item is CPAI-84�Flame Certified and NFPA-701 Flame Certified. Can you put a propane heater inside this? Yes, you can put that inside, but keep in mind this unit is CPAI-84 Flame Certified and NFPA-701 Flame Certified, which means it is flame resistant, not fireproof. Is it black on the inside as well? Yes, these sidewalls are black on the inside as well. Yes. Our rock club uses it for our fluorescent rock display at our annual show. I was wondering if this canopy is truly blackout; with everything closed, is the interior in total darkness? Thank you. This canopy is not 100% light-proof, but it will block out the majority of the light in the environment. 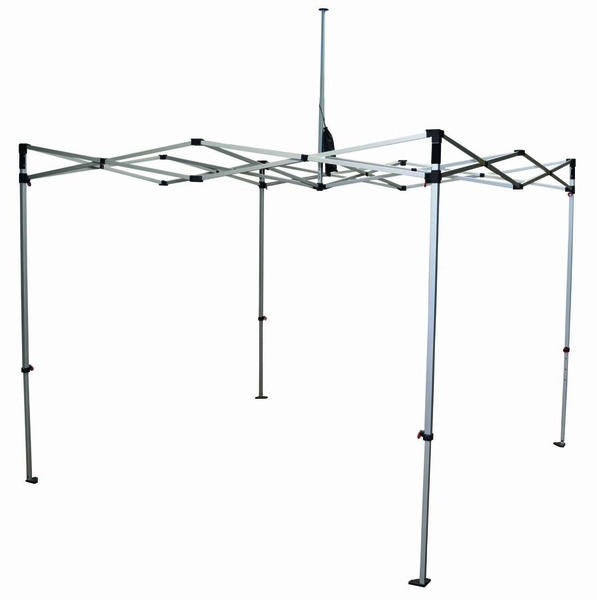 Do all of the sides of this Caravan 10 x 10 Alumashade black-out canopy package deal have zipper walls? Thank you for your inquiry. The Caravan 10 x 10 Alumashade Black-Out Canopy Package Deal + 4 Zippered Sidewalls has zippers down each side of the walls so it will completely enclose the tent. Only one side has a zippered opening. The other three only zip at the corners. What is the maximum height of the side walls? What is the height of the valence? The sidewalls and valance will carry the same maximum height setting of 7 feet. If you were to set this Caravan 10x10 tent up in an area that it could not be staked (on a sidewalk or cement), which weight system would you suggest buying for it? We would suggest you use our Canopy Premium Weight Bags - Set of Four. Can you have only a few walls up at a time? Do you need to have all four walls attached at all times? Yes, you can use these walls individually or in any configuration you choose. What is the highest point of this tent? What is the lowest standing point inside the tent? The peak of this canopy reaches about 12 feet high at its maximum setting while the headroom is approximately 7 feet. However, the lowest setting would put both of these approximately 1'2" lower. We already have a frame but would it be possible to get just the Black-Out Cover? Is there an option for just windows or half walls? We cannot sell only part of a package deal, however we do have these walls for sale individually. Caravan 250 Denier Sidewall There is not an option for windows. Do you offer a travel case for this item? Yes. A roller/storage bag is included with your purchase of this item. Is the Velcro hook and loop strip sewn to the inside edge of the tent? What color is the finish on this tent frame? The Velcro tabs are sewn to the top of the walls and will loop around the frame. This frame is a grey finish. What are the leg dimensions? How much does the entire unit weight? The legs are 1-1/8" thick. The entire kit weighs 55 pounds. Can I set this up on a hardwood interior floor or do I need to stake it into the ground? This item is free standing. It does not need to be staked if used inside. Is this 10 x 10 blackout tent waterproof? This tent is water resistant, but not waterproof. Here is a waterproof alternative. Do you have a screen side kit for this canopy and what color is it? Is this a pop up tent that folds down and can be put into a bag? What is the folded down size? Yes, it is a pop up tent that folds down and fits into a wheeled bag. The folded length is 64". Work in the television and film industry, and this works well for video village. Light enough to be carried around, but also durable enough to survive daily set life. Would definitely recommend this one, and it arrived very quickly. Sales staff was knowledgeable and friendly as well. ...Well assembled and works as advertised. My Lions Club performs eye screenings on young children and that requires a low light atmosphere, so that the child's eye are dilated. 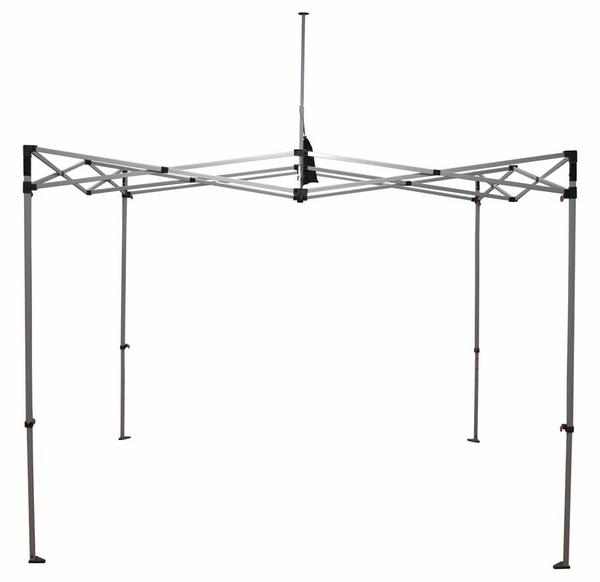 This canopy gives us exactly what we need when conducting an outdoor event. ConsIt is heavy when everything is packed in its travel case. This tent sets up with a breeze, is light, durable and easy to put back into the bag with cover in place. The tent was delivered quickly, was very easy to set up, and looks great. A good buy. I am the owner of Grampa Bardeen's Family Pumpkin Carving Set and we needed a black tent to shade our fun carved pumpkins at outdoor events. The black tent did the job, but I was surprised that the fabric for the black tent is thinner than that of the white. I liked the wheeled carrier, but the designer never put up a tent, had it rained on, took it down and then tried to fold the sides & top into the available space. I'm not sure why black is more expensive than white and the fabric is lighter. It would be nice if someone read this and can give a real answer to my questions! ProsBlack and shaded our carved, lighted pumpkins. Only black tent with sides that I could find. Delivery was on time. ConsBlack tent fabric lighter than the white tent yet it costs more? I have used the tent for only one festival so far, but it seems very solid and was very easy to set-up. The ordering was simple and delivery came early. ConsDid not include someone to set it up for me and it was not free. Very good, easy to use. Quick set up and down. I bought the black out canopy for my girls soccer team and it's great protection from the sun. Very light weight and study, sets up in one minute if you know what you are doing. This canopy performs exactly as I had hoped. I could not be happier with this tent. ProsThe black is so rich in color and it is made extremely sturdy. Our tent stands out amongst all the white tents in a crafting fair. The darkness of the tent inside allows our products to glow (we carry lights) I also purchased the side walls....good move!!! Yes I would recommend this tent to any one of my friends and or family. It takes a little more time to set up (minutes) then the quick easy up ones but it is truly worth the extra time. It is sturdier and of better quality then the less expensive brands...in the long run this one will save me money. This is the FIRST canopy that we've purchased where the sides fit snug and that looks very professional. We use this as our outdoor privacy enclosure for our photobooth. It looks elegant AND we are able to completely control the lighting conditions inside. Another Photobooth company recommended this product to us and so now we are too! P.S. 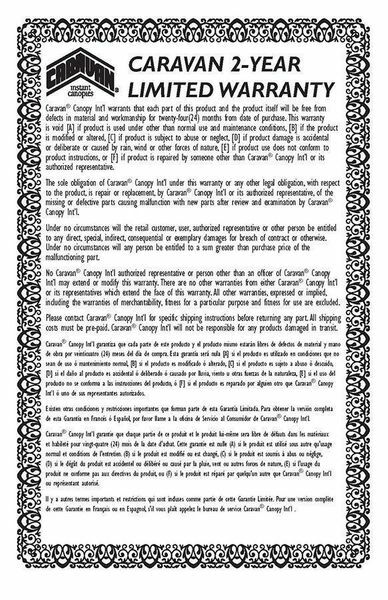 - We purchased the sandbags [you need to fill them with sand] to protect the canopy from moving when it is set-up on cement where it may be windy. Otherwise you can you the stakes that it comes with. ConsThe storage bag does not have any room for the sidewals so you must purchase a separate small duffle bag to store the sidewalls. These are sturdy, and come with a nice carry case. I would recommend. works great, only one thing zipper broke on one sidewall. Instead of getting what everyone else has (a white tent), I was looking for something to help me stand out in an ocean of tents for a big event...the blackout tent was the perfect thing; got lots more attention than I would have if I had the same tent that everyone else had. Friends warned me that I would roast in a black tent in July...I was prepared with several clip on black fans, but didn't have the electricity to run them, but honestly, it wasn't a problem; the tent wasn't hot, and I had better shade than the white tent people. The black material is nice; silky matte finish and totally opaque. Recommended!